The shortlisted nominees reflected the equality and diversity of the work that is taking place to celebrate, reveal and preserve histories and heritage across the region. 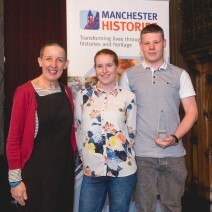 WCHG’s ‘WOWZone’ programme were proud to have been recognised and shortlisted in the Communities category of the Manchester Community Histories Awards 2016, for their project, ‘Wythenshawe, Manchester’s Garden City’ The project went on to receive a trophy and commendation for their work. The award was presented by actress, Julie Hesmondhalgh. Each nominated project took to the stage to present information about their project and their involvement. Young people Hayley Sutton and Ben Dixon represented the WOWZone and spoke confidently about their involvement as part of the project management team.